The University of Nottingham has unveiled plans for what it claims would be Britain's tallest free-standing work of public art. 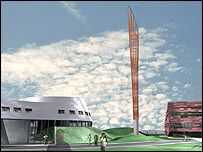 The 60-metre red and orange steel girder tube, named Aspire by staff and students, is being funded by an anonymous benefactor. If built on the Jubilee Campus, it would top the 20-metre Angel of the North and 52-metre Nelson's column. The £800,000 project is currently being considered by city planners. It is intended the sculpture will be lit at night. Outgoing Vice-Chancellor Professor Sir Colin Campbell, said: "Aspire is about the University and the city making a bold statement about its future, and seeking the positive recognition Nottingham thoroughly deserves." Designer Ken Shuttleworth added: "Our design has evolved out of the desire to create a dynamic sculptural form which symbolises both the innovation and expertise that the University of Nottingham represents, and the exciting new era that the university enters as Jubilee Campus undergoes its transformation. "We're particularly pleased that students and staff of The University of Nottingham have been responsible for actually naming the sculpture." The Jubilee Campus was opened by The Queen in 1999 and houses the schools of education, computer science and information technology, as well as the university's business school.